Dailybuzz.ch: Adrienne Bailon Responds To Kardashian Feud - Round Two! Adrienne Bailon Responds To Kardashian Feud - Round Two! Here comes round two! 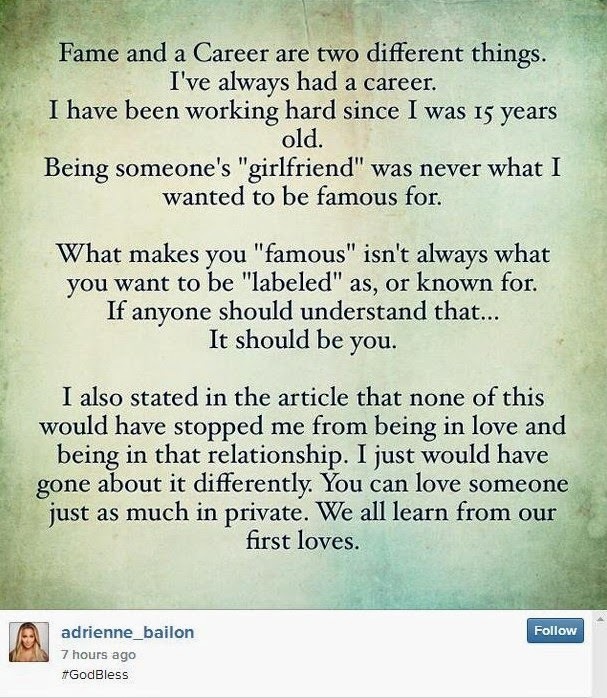 Adrienne Bailon defended her comments about Rob Kardashian via Instagram on Thursday, July 31, one day after Rob's sisters Kim and Khloe Kardashian took her to task for dissing their family. "Fame and career are two different things. I've always had a career. I have been working hard since I was 15 years old. Being someone's 'girlfriend' was never what I wanted to be famous for," Bailon, 30, wrote. "What makes you 'famous' isn't always what you want to be 'labeled' as, or known for. If anyone should understand that…It should be you," she continued. The feud between the star and her ex's family began when Bailon aired her grievances about Rob in an interview with Latina magazine earlier this week. "To be stuck with that Kardashian label, that was so hurtful to me and to my career," she told the mag. Bailon also noted how it "always bothered" her when people would ask why she didn't forgive Rob when he cheated on her. "He messed up," she said, and "was so disloyal." Kim, in response, defended her brother via Twitter. "Funny how she says being with a Kardashian hurt her career yet the only reason she has this article is bc she is talking about a Kardashian," the reality star wrote on July 30. "So sad when people try to kick my brother when he is down #FamilyForever." Khloe appeared to be taken aback by Bailon's comments, as well. "Thought her and I were cool SMH," she wrote, retweeting a fan who commented: "Adrienne has a lot of nerve to talk s--- about Rob when he is obviously dealing with s---." Bailon ended her Instagram message with a positive outlook on her relationship with Rob, which lasted from 2007 to 2009. "I also stated in the article that none of this would have stopped me from being in love and being in that relationship. I just would have gone about it differently," she wrote. "You can love someone just as much in private. We all learn from our first loves."